When it comes to recommended dining in Chicago, newspapers and magazines tend to promote certain neighbourhoods more than others. Lincoln Park. Lakeview. Andersonville. Near West Loop. Near South Loop. Hyde Park. Wicker Park. Bucktown. Logan Square. River North. Uptown. Downtown. These are the ones that receive the most press and rightfully so. But these neighbourhoods comprise a rather small percentage of Chicago as a whole. In my politically correct vernacular, restaurants in these areas tend to cater to those with milder palates, lest some editorial gets posted by someone who was red in the face from spicy food. Along the lines of seeking something not a part of the common recommended eateries, I happened upon a Japanese sushi bar and Thai cuisine restaurant in Chicago’s Portage Park. At 4431 N. Milwaukee Avenue, Ruk may be found. Granted Portage Park is undergoing an incredibly slow urban renewal, there are some pearls that are starting to dot the landscape as buildings that were once vacant have since transformed into bars and restaurants. Ruk is one of these new establishments. 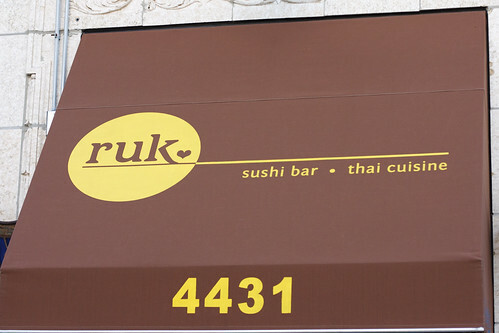 With an interior that looks like it was once a sports bar but now has a minimalist feel, Ruk is a great culinary boutique for some of the best sushi and Thai cuisine in Chicago. Upon entry, you are greeted with a welcome and escorted to any of the window seats. Yes, everyone gets a window seat. 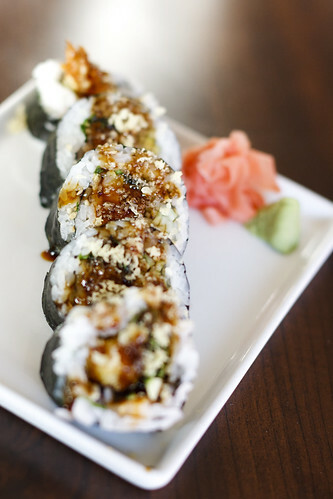 Behind the counter were two young Mexican sushi chefs who deserve high marks. This is the second sushi bar I have gone to where the sushi chefs were Mexican and who could easily raise the bar for flavour in the food without compromising the authenticity of the experience. Hungry as usual and daring to boot, I ordered two maki rolls and a Thai dish. 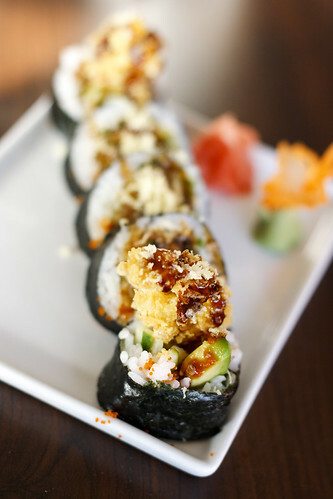 I started with a crunchy shrimp maki that had shrimp tempura, cucumber, scallion, tempura crunch, masago, spicy mayo, and kabayaki sauce. Although the shrimp had been cut, there was still a lot of it in the roll. For there to have been five pieces, it was filling and the preparation had so much flavour without going all over the place that I could have ordered another crunchy shrimp and not had any remorse about possibly not trying another roll. But I ordered a spicy ebi tempura instead. Shrimp tempura, spicy mayo, cucumber, and scallion worked together in a magnificent combination that had me nodding to the sushi chefs in appreciation — I sat across from the sushi stand. I had a mind to order another sushi roll, but I wanted to try something from the Thai menu. I must admit that I find it fascinating that there seems to be a constant pairing of Japanese and Thai in Chicago, neither pairing cuisine with countries that border them. 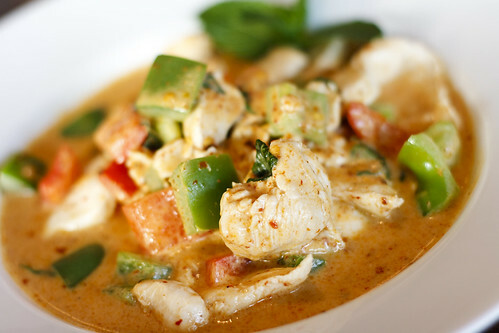 I have only experienced a blending of Thai, Indian, and Burmese cuisines in Toronto. Then again, Toronto is Utopian in its cultural diversity. But that is quite okay. And it was just fine when the panang chicken came to the table. I have had panang that was so bad that I wanted to throw the bowl against the wall. I have had panang so good that my eyes rolled back in my head. And then I taste the panang — and I ordered it Thai spicy since I have no mild palate — at Ruk and all I wanted to do was hum while my foot kept tapping the floor. The panang gravy was not hearty, but it was thick nevertheless and the taste-vibrant green and red peppers were the ideal accent. To the cook who prepared that dish with fresh chicken and superb panang deserved an applause. In fairness to the newspapers and magazines that give plugs to the aforementioned neighbourhoods as having the best cuisine, I understand that they want to promote businesses that will be comfortable for the multitude. Having gone to most of the recommended eateries, I can attest to how delicious the meals were that I had eaten. However, the atmosphere in many comes across “upscale sports bar for the professional man and woman.” Loud and boisterous, you have to yell to be heard. Dining should not come with aggravation, even if the food puts many New York City restaurants to shame. But a few miles away from those locations are some of the absolute best authentic cafes and restaurants. And this, ladies and gentlemen, is why I continue to seek many fooderies — my made-up word — where my appetite and I may be sated while continuing the quest for finding as many holy grails of dining as possible.